his remarks referring to the all too common phenomenon in recent times of demolishing little coastal shacks in favour of Mc Mansions, he also added that “People go to a place because they love it, and then they want all the things they had back in the city, so they end up transporting the city up to wherever they thought was beautiful. Everyone is building these great enormous houses that, as far as I’m concerned, are pretty much identical and not unique to the Coast, it’s almost a bastardised international style that is coastal and modern, but very similar everywhere you go, it is not sustainable”. 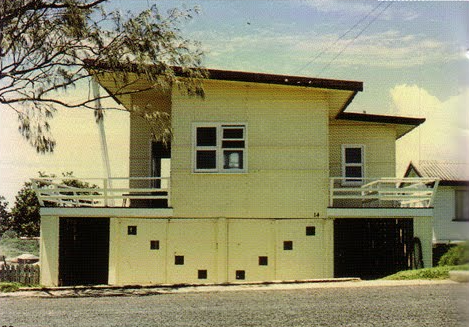 It has been said by other notable local architects such as Lindsay and Kerry Clare that these little fibro beach shacks have an important role to play in the history of Queensland coastal housing vernacular. There was an economy of construction and detail in these buildings and a restraint which is sadly not adhered to today. Over time the small scale fibro ‘weekenders’ developed their own unique identity, character and place within the Australian landscape. Both modest and modernist , austere in both plan and materials, lifted up on posts, with simple skillion or gable roofs. Commonly they were just simple single-room pavilions, separated for living, sleeping and washing. The humble nature of these little houses created a distinct identity as a community, the limited choice of materials and colour added to the character of the town and the scale of the dwellings reflected the surrounding coastal landscape. They became an intrinsic part of our history and an expression of aspirations for a relaxed lifestyle. Contemporary coastal architecture is rediscovering the appeal and adaptability of the humble FC sheeted shack. Through a process of extracting the key principles and elements that influenced traditional buildings it is possible to deliver a new hybrid architectural language. Clare , & Clare, K., 1997. The Fibro Frontier. Sydney, NSW: Powerhouse Museum. Marshall, R.,2007. Searching for a style of our own. Maroochydore, QLD: Sunshine Coast Daily.